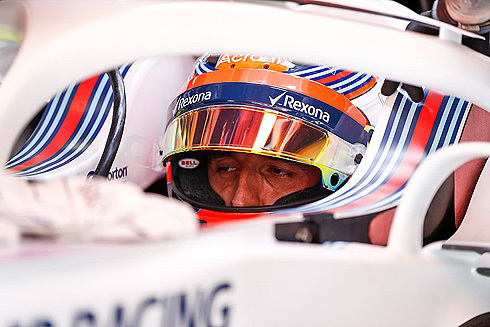 The opening Friday practice session for the 2018 Spanish GP would see a large amount of interest in the Williams Martini team with the return of Robert Kubica. But by the end of the session the team was brought back down to earth with both Williams cars finishing slowest in the session. Both Robert Kubica and Lance Stroll would run on the supersoft tyre for the session but both would struggle with the pair having spins. For Lance his spin would see him retire early from the session. Despite running various upgrades on the FW41 it was not the result that the Williams team was hoping for. 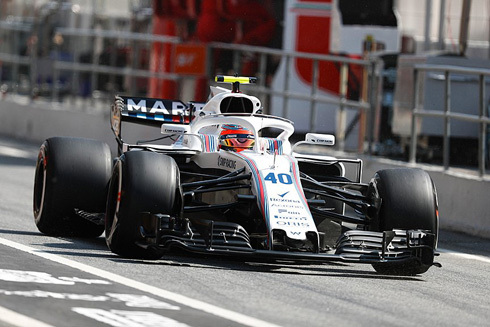 For the Williams Martini team Friday practice for the 2018 Spanish Grand Prix would be marked by the return of Robert Kubica, who would replace Sergey Sirotkin the opening Friday session. Robert would be amongst the first out with a mix of soft and medium tyres been used. The second Williams would also complete its installation lap also on the medium tyre. The first times would be set with Vandoorne going quickest with a 1m:22.529. Others would go quicker with Raikkonen fastest with a 1m:20.336 on the soft tyre. He would improve with a 1m:20.262 followed by Alonso and Vandoorne. Hamilton was able to move to the top of the times with a 1m:18.997 running on the soft tyre. But Bottas would go quicker with a 1m:18.703. Third was now Raikkonen followed by Vettel, Alonso, Ricciardo, Vandoorne, Verstappen, Grosjean and Gasly in tenth. Vettel would move into third. The track was seeing quite a few drivers spinning including Bottas, Vettel, Hartley, and Grosjean. Bottas would improve with a 1m:18.695 with Hamilton second followed by Ricciardo, Vettel, Alonso, and Verstappen 6th. But Ricciardo would go into the barriers bringing out the Virtual Safety Car with under an hour remaining. Currently the Williams cars were 18th and 19th with Robert leading Lance. The Mercedes cars were well ahead of the rest of the field leading by over a second with an empty track. With forty minutes remaining drivers would start to return to the track with Bottas improving with a 1m:18.441 to be quickest by 0.5. 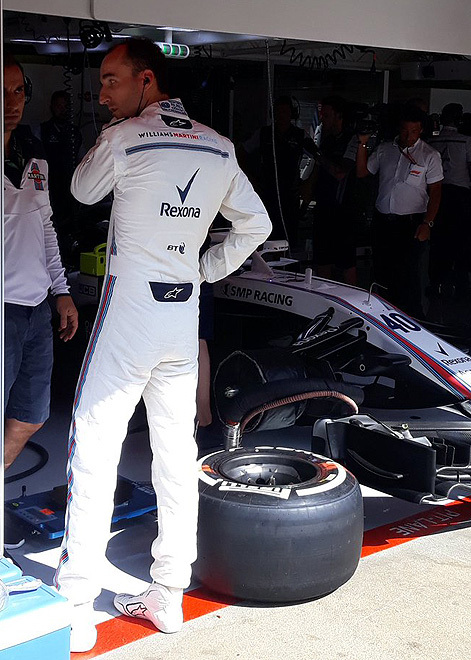 Several other drivers were running on the supersoft tyre while for Williams the session was going far from well. There would be a Virtual Safety Car period which would end with the removal of Lance's car after his spin. Bottas would improve with a 1m:18.148 to be 0.8 ahead of Hamilton. As the session progressed it would be Bottas leading from Hamilton, Vettel, Verstappen, Raikkonen, Alonso, Ricciardo, Grosjean, Vandoorne and Gasly tenth. They would remain in this order with the end of the session. The Williams drivers would finish slowest. Lance would wait until the track was quite clear before coming out for his installation laps also using the medium tyre. Lance would also come out on the supersoft tyre for his first run. He would set a 1m:24.077 to be behind his team-mate. After a short run Lance would pit but he would return still on the supersoft tyre. Lance would complete a short run prior to pitting again. Lance would return to the track still running on new supersoft tyres. Lance would improve with a 1m:22.756 but he was still down the times in 18th. Lance would say that he could not believe how bad the balance is. Lance would spin at Turn five just missing the wall. He was not able to continue getting out of his car. His car would start the journey back to the pits as the Virtual Safety car was deployed. Lance was now slowest and not able to return to the track. Robert would make his return in his first F1 session for many years running on medium tyres for his installation lap. He would pit after a single lap. Robert would return running on the supersoft tyre. He would set a 1m:24.278 on what was a fairly slow lap. Robert would improve with a 1m:23.386 then a 1m:23.259. Robert was currently 6th but as the session progressed he would drop to 17th and he would pit. He would return but would pit again having completed nine laps. Robert had been running with various upgrades but still had an old floor. So with his stop the mechanics would start to switch his car to the new floor. Robert would also come back out also staying on the supersoft tyre. Robert would spin at Turn 13 but he was able to continue. After the end of the Virtual Safety Car period Robert would continue his run and was able to set a 1m:22.205 to move ahead of his team-mate. This would be followed by a 1m:21.510 to be eighteenth. He would drop to 19th. Robert would pit briefly but would come out again still on the supersoft tyre. He would pit with the end of the session.